Misty Grove is one of the Myriad Realms of Revelry realms created by Sanguine, where he is holding a feast with some of his followers. The Misty Grove is only accessible through a magic portal found in Morvunskar during the related quest. 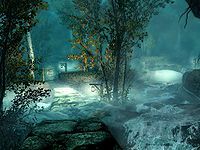 It is a grove that can only be reached once you have followed the clues to locate Sam Guevenne during the related quest. You travel here by entering a portal found inside Morvunskar. 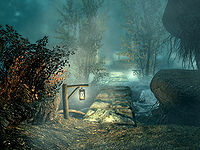 Upon being transported here you arrive at the beginning of a sunken path lit with lanterns spaced evenly along its length, with raised banks on both sides preventing you from straying too far from the fixed pathway. It crosses and recrosses a burbling stream flowing from north to south which also has raised banks. It always appears to be mid-late evening when you arrive. As you travel along the path it is possible to catch a few torchbugs, but there appears to be no other creature or any harvestable plants, flowers or fungi in the grove. The path leads to a clearing predominately filled with a long table laid with a feast of four salmon steaks, a honey nut treat, a long taffy treat, four bottles of wine, several loaves of bread and pieces of cheese. Around the table are sat eight Commoners who are carousing and seem fairly deep in their cups, wearing a collection of common clothing, but not carrying any other items. There are two smaller tables beside the main table with small mead barrels on top and strings of lanterns hanging overhead lighting the whole clearing. Finally, there is Sam Guevenne, who reveals himself to be the Daedric Prince Sanguine after conversation. He gives you his staff and returns you to the inn you first met and agreed to the competition. Any items you picked up while in the grove remain in your inventory when you return. If you return to Morvunskar after completing A Night To Remember, sometimes the portal to Misty Grove will still be accessible. Passing through it will end with you being stuck in Misty Grove, as Sanguine is no longer there to teleport you out. On the PC, you can open the console and type tcl to toggle collision, and then fly under the map, just below where you enter Misty Grove, to find a door that will take you back to Morvunskar. This page was last modified on 27 September 2018, at 09:43.